Matcha (Japan) - 1.0 oz. Contains very high antioxidant level 10% vs 5-6% for mass-market teas. When consuming matcha you actually consume all the tea leaves crushed into a fine powder. Scientific testing in Japan has indicated that because of this, the antioxidant benefit of matcha can be up to 5-9 greater then with normal green tea consumed in the conventional manner. Character: Has a jammy-like smoothness with a very satisfying full cup. Gyokuro leaf base gives a light astringent finish. 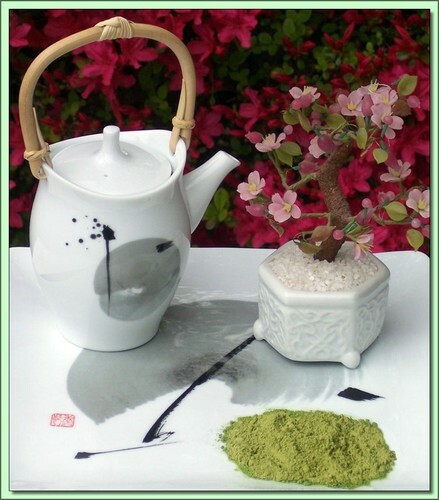 This Matcha is a fabulous example of a high quality Japanese Matcha. The tea has a pale emerald green color and when consumed on its own, frothed up with a whisk, has an almost jammy-smoothness belied by a somewhat sweetly astringent cup. You can spoon this powder directly into a cup with hot water to dissolve the powder. A 40g bag should make 20-25 cups (e.g half a teaspoon per cup). This Matcha contains, by volume, higher concentrations of catechins and vitamins. Matcha is an excellent choice if using green tea for cooking and baking. Because Matcha consists of stone ground leaves it contains, by volume, higher concentrations of catechins, vitamins and L-theanine which is linked to increased alpha brain wave production and is considered a natural antidepressant, stress reliever and energy booster. Matcha contains approximately 10 times the polyphenols of regular teas. Produced under ISO 14001 Certified Environmental Management Standards. Hot Tea: Bring filtered or freshly drawn water to a rolling boil and let cool to roughly 1 80°F/82°C. Place approximately of a teaspoon of Matcha in your cup. Infuse with 8oz/250ml of water, whisk briskly and enjoy. Blend ice, Matcha and ginger in a blender until ice is crushed. Pour into a chilled glass. Add lime juice and honey to taste. Iced matcha latte: Use 1/2 tsp. (1g) per 8oz. (225ml) serving. Add 1/2 tsp. (1g) to base of cup and add 2oz. of hot water & mix vigorously to make a smooth paste like liquid. Top with freshly steamed milk (or substitute) and sweeten to taste. Cool for 30 - 60 minutes and pour over ice. ceremony tools. (Bowls, scoops, and a whisk). e bowl with a paper towel.